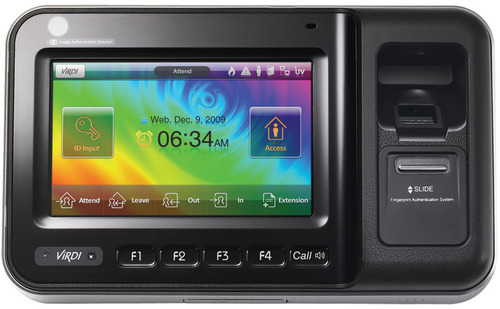 With compact design, the offered product range of Virdi AC 6000 High Performance Industrial Fingerprint Based made available by us in the market. Making of this range is done as per the set industry norms and guidelines, utilizing the finest raw materials and modern machines. In addition to this, the offered range is marked at the most reasonable rate possible. These finger print readers come with the facility of finger registration single/multiple fingers attendance machine with ginger image options. We take the opportunity to introduce ourselves as India’s premier consultancy & engineering organization that has been providing turnkey solutions in security domain to the all types of government & corporate sector. We have been involved in designing the systems for Offices, IT Campus, Commercial Complexes and Industrial projects. We are well focused on delivering values rather than products and commodities to people and organizations associated with us. Weather we always lies in providing the most satisfactory and best user experience possible. Our Design & Engineering Services have main thrust on energy conservation, safety and current progressive technological developments, commensurate with environmentally sensitive design.